Stoffel Vandoorne climbing out of his car after stopping on track during preseason testing at Circuit de Catalunya in Barcelona. The finale of the Formula One season last year was a hard one for me. It was the end of a long, one-sided relationship I’d held with the McLaren-Honda F1 team partnership, in which the Honda engine miserably failed and I made constant, possibly annoying jokes about it. I really enjoyed the bond we had there. But luckily for me, it sounds like the reliability jokes aren’t quite over yet—in more than just the engine department. While anything is an improvement from those Honda F1 engines McLaren got rid of for Renault this year, it sounds like the team still isn’t having much luck so far. McLaren’s cars have broken down four times so far this week during testing in Barcelona, according to Sky Sports. 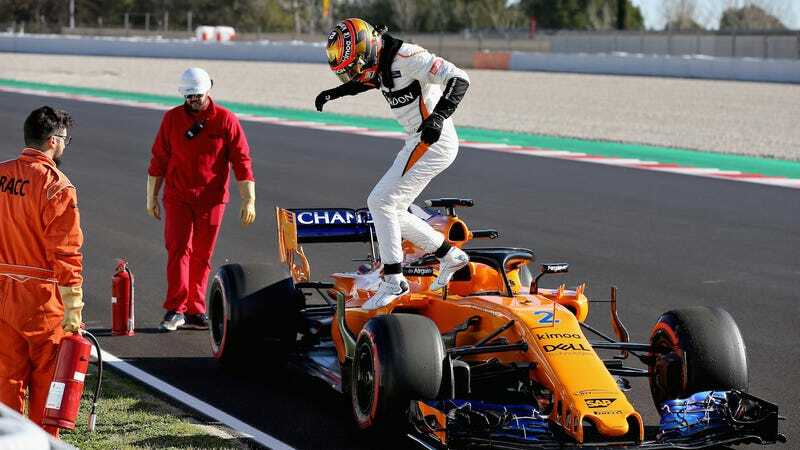 The first three breakdowns came on Stoffel Vandoorne’s race car, with the BBC reporting that two were the result of battery issues and the third was a loss of hydraulic pressure. The fourth breakdown came with Fernando Alonso, whose sadness about his race cars reached peak internet fame a few years ago when he got a lawn chair at the track and started the “places Alonso would rather be” sensation. Alonso stopped on track in the second day of testing on Wednesday, and McLaren found a small oil leak and changed the Renault engine. Alonso is setting fast lap times, at least, even if the BBC reports that McLaren completed the fewest laps of anyone on Tuesday. The leaderboard from the morning session of Wednesday testing showed Alonso in fourth place overall behind Daniel Ricciardo, Lewis Hamilton and Sebastian Vettel. The team also got his car back out for the last few minutes of testing on Wednesday, and Alonso finished sixth overall on the board. But fast doesn’t mean much if reliability isn’t there. That would be a familiar narrative for McLaren if it happened again this year, but it’s too early to tell. If reliability does go poorly for the team this year, though, the only logical next step will be to find a race car that runs exclusively on Alonso’s tears.